Two performances of "The Ugly Duckling" on Friday, April 27, will bring an exciting and educational conclusion to this year's Children's Performing Art Series at SFA. NACOGDOCHES, Texas - The Children's Performing Arts Series at Stephen F. Austin State University will celebrate a classic tale of friendship and self-confidence when Virginia Repertory Theatre presents "The Ugly Duckling" in two performances on Friday, April 27, on the SFA campus. Most children know the literary fairy tale by Danish poet and author Hans Christian Andersen of the swan who grows up "ugly" in a family of ducks, later to find his appearance changing as he discovers his true identity. 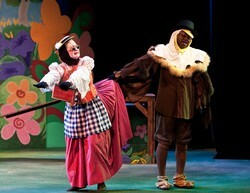 "Virginia Rep unites the classic ugly duckling with other animal 'misfit' heroes from the folk traditions of other cultures who work together to earn their home on the King's estate and find the self-confidence that only friendship and accomplishment can provide," said Diane Peterson, Fine Arts Box Office manager and director of the children's series. This production of "The Ugly Duckling" is a musical written by Richard Giersch, based on Andersen's classic fable. "Join the Children's Performing Arts Series for this all singing, all dancing, all delightful musical," Peterson added. This production targets children in kindergarten through fifth grade. An online study guide at cpas.sfasu.edu assists teachers in incorporating classroom activities, including having students write their own fairy tales, into their curriculums. Other core instructional activities focus on elements of history, science and social sciences. Performances are at 9:30 a.m. and 12:30 p.m. in W.M. Turner Auditorium in the Griffith Fine Arts Building. Tickets are $7.50 for individuals and $6 per person for groups of 20 or more.